What Does Ben Carson Think About Obama? The GOP Candidate Has Called Him A "Psychopath"
Ben Carson, who has increasingly become a popular figure within religious and conservative circles, has never held a political position before, but he's aiming big on his first try — he wants President Obama's seat in the White House. As of Monday, the ever so controversial retired neurosurgeon and author is officially running for president and wants to nab the Republican Party's nomination. So what does Ben Carson think about Obama? Well, for one thing, he's compared Obama to a "psychopath." Like most psychopaths. That's why they're successful. That's the way they look. They all look great. Carson has also repeatedly blasted the Affordable Care Act, aka Obamacare. Sitting just a few feet from Obama during the National Prayer Breakfast in February 2013, Carson criticized the president's health care agenda. And during the Values Voter Summit in Washington last October, he called Obamacare "the worst thing that has happened in this nation since slavery." You know Obamacare is really I think the worst thing that has happened in this nation since slavery. And it is in a way, it is slavery in a way, because it is making all of us subservient to the government, and it was never about health care. It was about control. He's also made controversial statements against Obama's role as president. In an interview with CNN's Wolf Blitzer, Carson compared the United States under Obama's leadership as a "Nazi Germany." Carson was already toying with a presidential run at the time and said he would not retract his statement. The people in Nazi Germany largely didn't believe in what Hitler was doing. But they didn't say anything? Of course not, they kept their mouth shut. The fact that our government is using instruments of government like the IRS to punish its opponents, this is not the kind of thing that is a Democrat or a Republican issue. This is an American issue. ... A lot of people do not feel free to express themselves. 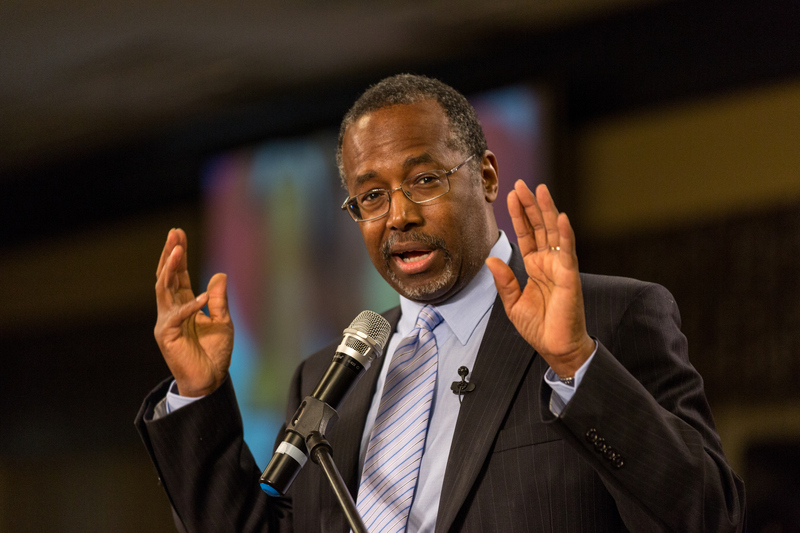 Just in November, Carson was polling second among GOP voters with 10 percent of the vote, according to CNN. But The Washington Post has argued that Carson's increasingly outspoken criticism of Obama has caused him to lose some support from the black community. His voter base is much whiter and much more conservative. Once a rising star and top contender for the GOP ticket, Carson could find himself on the fringes of the Republican playing field.